You thought you were done, huh? 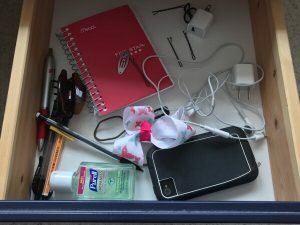 Well, have you ever cleaned out a junk drawer? And then forever and ever there after that drawer stays exactly as organized? Estate planning works the same way. You have your documents done. That’s great. But don’t forget the next step. Just like any organization, your documents are the tools to keep things organized. In this case, organization is leaving as few and as easy things on the legal to-do list as possible. Legal things like an efficient transfer of assets and a plan for the care of your kids. 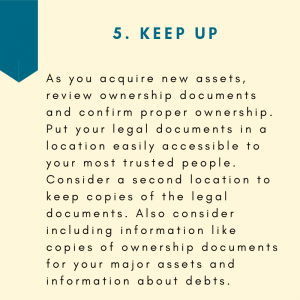 But now that you have documents to help with that to-do list, you need to keep the documents in a secure location that’s still accessible for the people you’ll leave behind. 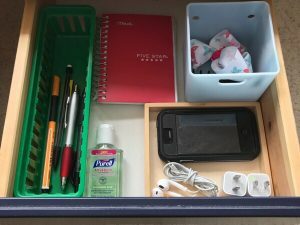 Once you think through storage, you need to remember to keep your plan organized. Organization is going to look different for different people, depending on their location, family situation, and assets. Joint tenancy between spouses, trusts to avoid probate, other ways to avoid probate, or planning for assets to be administered through probate can be the right fit for different types of situations. But new assets can throw things out of whack. Let’s take a trust. Let’s say, that after all things are considered for your particular situation, you and your coach (attorney) decide that you really need to avoid probate and the best option to do that is through a trust. So, you have a trust and your real estate is deeded to the trustee. Great. Your plan is in place. And then you move. And you don’t remember to tell the real estate closer about the trust. Whoops. Not only do you have a trust. But if you don’t fix this before you die, you might very well have a probate. Every year or two, it’s a good idea to review your deeds, car titles, and account information for bank accounts, life insurance and retirement benefits to make sure your plan continues to be in place. I even made a handy tool to help you do that. Look for the asset checklist, under the content page. Thinking through the question, “And then what happens?” as you acquire assets helps you keep things organized. Keeping updated documents and information accessible to the people who are going to have to deal with it after you go. Remember. Just because you’ve done your documents doesn’t mean you’re done. But, if you keep up on your plan, you’ll know that when you die, your loved ones will have a manageable to-do list. Questions? How About Some Answers. I'm Jennifer Gumbel. 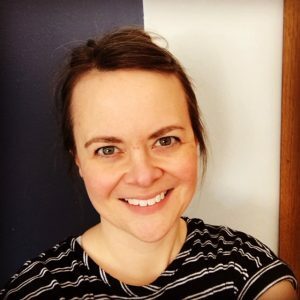 A wife, a mom, and a Minnesota death lawyer, helping you make your death as organized as your life. I’m Jennifer Gumbel. A wife, mom, and estate planning attorney. I have a compulsion, not only helping families deal with the legal fallout after someone dies, but helping people get their affairs in order to minimize the fallout for their loved ones. Legacy is far more than money. It's what you'll be remembered for. And you are making it everyday. Join Jennifer as she challenges you to think about leadership in a new way. Join Jennifer as she gets on her soapbox to talk about what every estate planner wished people could get their head around and how it can change how you live. Learn something new? Share it!